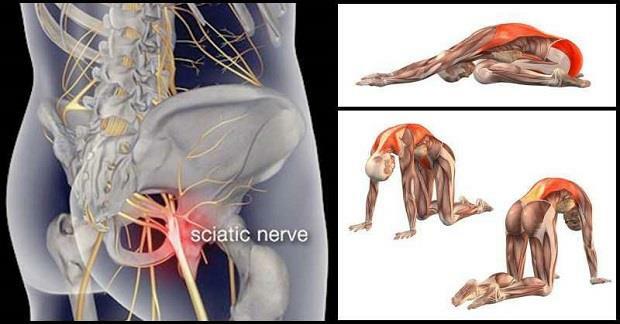 Sciatic nerve irritation causes hip and lower back pain, which spreads downwards to the limbs and feet. About 4 out of 10 people will develop sciatica or irritation of this nerve at some point in life. Sciatic nerve is located deep in the buttock, beneath the piriformis muscle, so its constriction and swelling can also cause sciatica pain and irritations. The muscle connects the top of the femur to the spine, and it’s the main one that supports the outward movement of the hip, upper leg, and foot. This nerve can pass through this muscle and thus cause sciatica symptoms, or known as piriformis syndrome, characterized by pain in the lower back and hips, poor movement, and balance. The main cause of this pain is the swelling or constriction of the piriformis muscle, but it can also be a result of some other factors as well. This pain is treated with medications, like aspirin, acetaminophen, or NSAIDs, physical therapy, and surgery. Often the intense pain is treated with antidepressants, muscle relaxants, and painkillers. You will just spend your lifetime on medications if you just numb the symptoms and do nothing about the irritation of the nerve. These piriformis stretches offer incredible effects in the treatment of sciatica pain. You also must warm up before the stretches for a few minutes, and remain within the comfort limits. You should consult your spine specialist first and start with these piriformis stretches for sciatica relief. You will be amazed by the positive effects! You should put the painful leg over the other leg’s knee, lower the hips toward the floor at a 45-degree angle, while bending the knee of the standing leg, lean forward and extend the arms to be parallel to the ground. Hold for 30-60 seconds with a straight spine, and switch legs. You must lay with the knees bent upwards, cross the painful leg over the other by bending it upwards toward your chest. Grab one knee with one hand, and the ankle with the other. Than you need to pull gently toward the shoulder in line with the ankle, and hold for half a minute. Lay on the back, with the affected leg bent upward, and place the foot near the back of the knee of the other leg. You need to tuck the foot and twist the leg to the opposite side by making the knee to face or touch the ground. You should put the arm on the knee, and raise the other in the air. Than start lowering the other arm toward the opposite direction of the knee, and hold for 20 seconds. After that switch legs and repeat. Place yourself with the hands and knees on the ground, drag the affected leg’s foot underneath the trunk and twist it toward the opposite side, close to the hip. The knee must point toward the shoulder. You should lower the head in order the forehead to touch the ground, and lean the forearms on the ground. Stretch the other leg behind you with a straight pelvis, and slightly push the hips towards the ground. Stretch for half a minute and make 3 repetitions. You should sit on the floor, stretch the legs straight out and far apart. Tilt slowly the torso forward toward the ground and put the hands on the floor next to each other. You need to lean forward in an attempt to touch the elbows to the ground, and hold for 10 to 20 seconds. Place yourself with the hands and knees on the ground, and the hands aligned with the shoulders, tilt the weight off the painful leg and elevate the leg upward toward the ceiling. Lower it slowly , and make 15 repetitions. Lay on the side, so affected leg to be on top. Bend the legs backward to get an L shape, but one foot should remain over the other and the legs should be parallel to each other. By sitting on a chair, you should start with the affected leg over the other leg’s knee. Your chest must be forward and bend forward a bit, and hold for a few breaths. Try to bend a bit more, and remain thus for 30 seconds. Make repetition with the other leg. You should it on the floor and put the soles of your feet together in front of the pelvis. You need to hold the ankles, with the opposite hands, push downward with the knee in order to touch the ground with them, and hold for half a minute. Than release and in the next 30 seconds, flutter the legs in that position . You should lay on the ground with the legs flat and the back straight, bend the painful leg upward, and put the foot on the outer side of the other leg, close to the knee. Pull the knee of the painful leg across the midline of the body, with the other leg , and hold for 30 seconds. Do 3 repetitions.